If you read my last post, you know that I was stuck watching the Tampa Bay Buccaneers commit two stupid penalties to cost themselves a chance at an upset victory over Cincinnati. This pushed their game past the 4:00 mark, leaving me with little time to get to Orlando in time for the 6:00 start of the UCF basketball game. Once the outcome was decided, I ran out of Raymond James Stadium and over to my car about 10 minutes away. My parking choice in Lot 13 was smart as I avoided the postgame snarl, at least until I discovered the nearby on-ramp I had planned to use was closed as a result of ongoing construction on I-275 through Tampa. This added 15 minutes to my trip as I had to head back into the traffic, using Dale Mabry Hwy to get to the 275. After much cursing, I was finally on the highway heading east, and quickly made my way to I-4, with about 100 miles to go to the arena in Orlando. Then I ran into my second delay: the left-lane lollygagger. This driving specimen is most commonly found in Florida, where it leisurely occupies the leftmost (read fast) lane without noticing the long line of frustrated drivers behind it. When the speed limit is 65, the left lane on a three lane highway is for going 80 or faster. Not for going 70. Or 75. If the car behind you is closer than the car in front of you, you are going too slow. Get over. I got a game to get to. 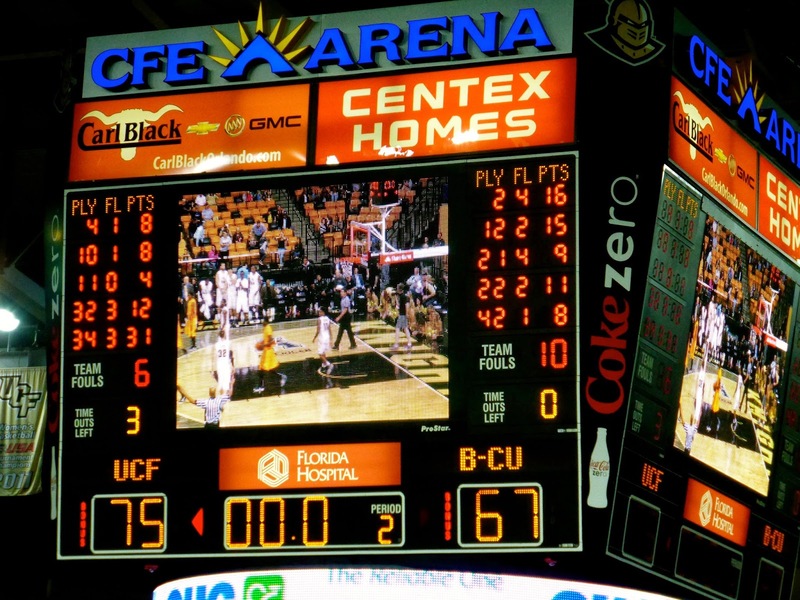 Anyway, I eventually did get to Orlando and arrived at the UCF parking garage ($5) just around tipoff. 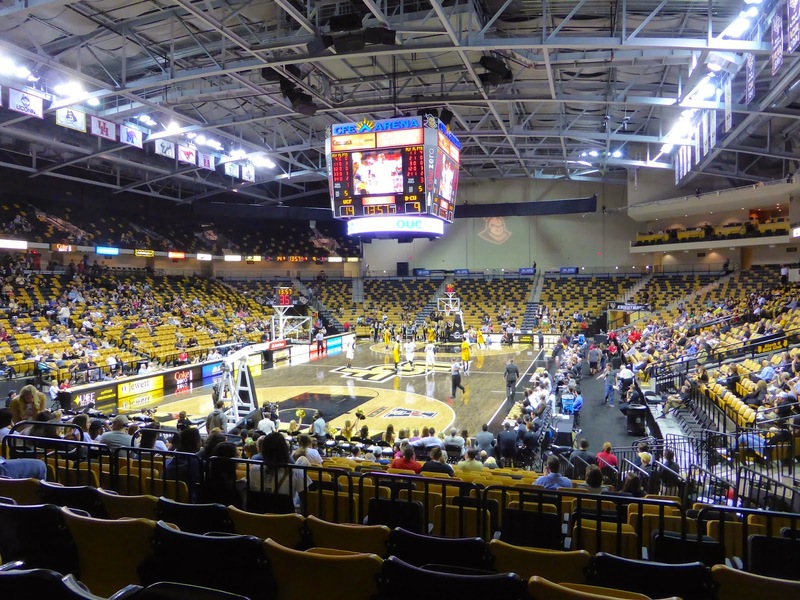 From there, I ran to the CFE Arena box office to get a $5 ticket and then into the arena, taking my seat with five minutes gone in the first half. Good enough. 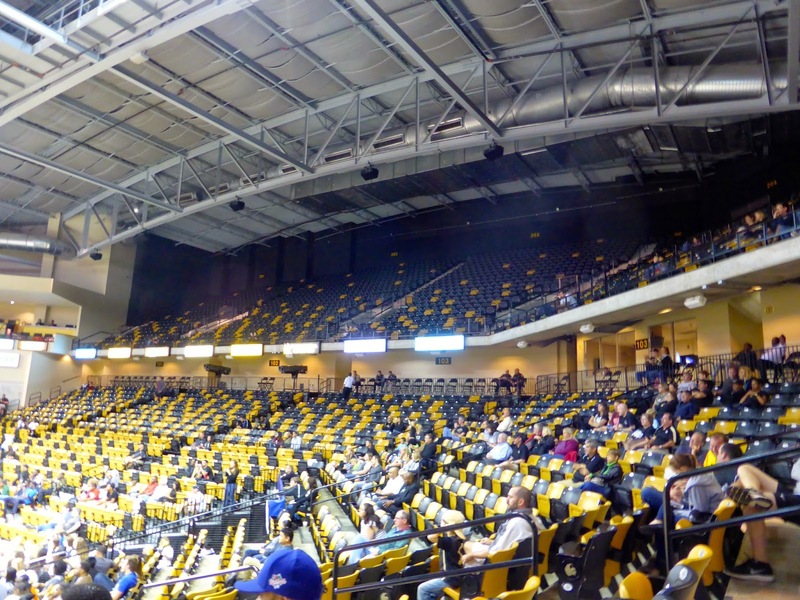 With Bethune-Cookman in town, there weren't that many fans, as you can see in the empty lobby shot below. 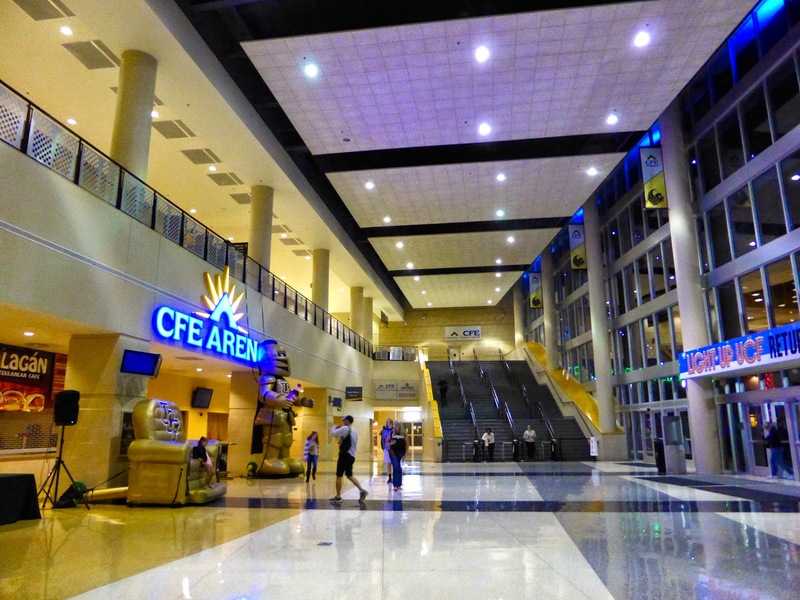 CFE is a credit union in Central Florida that bought the naming rights to the arena last year. 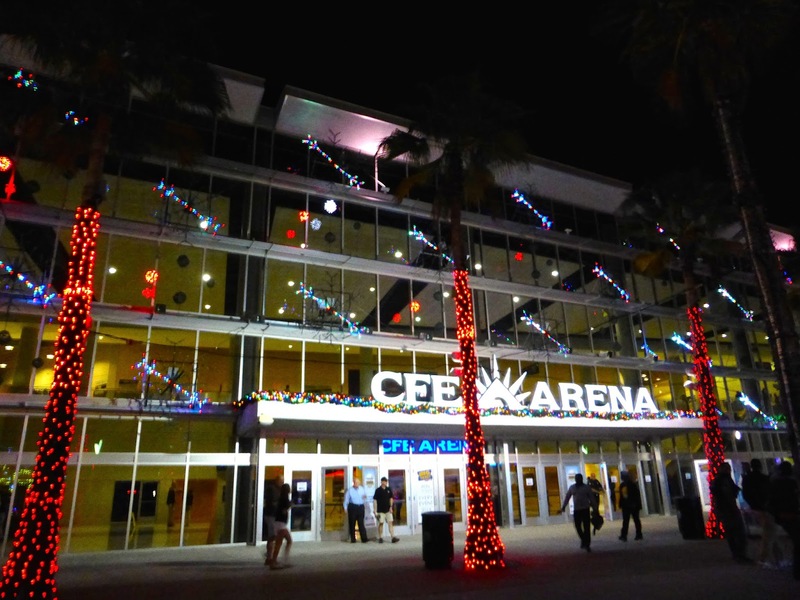 The previous name was UCF Arena, so CFE paid an awful lot of money for one letter. The Knights colours are black and gold, which you can probably figure out pretty quickly as soon as you enter the seating bowl. Even the court is uniquely designed; you won't mistake seeing this place on TV. 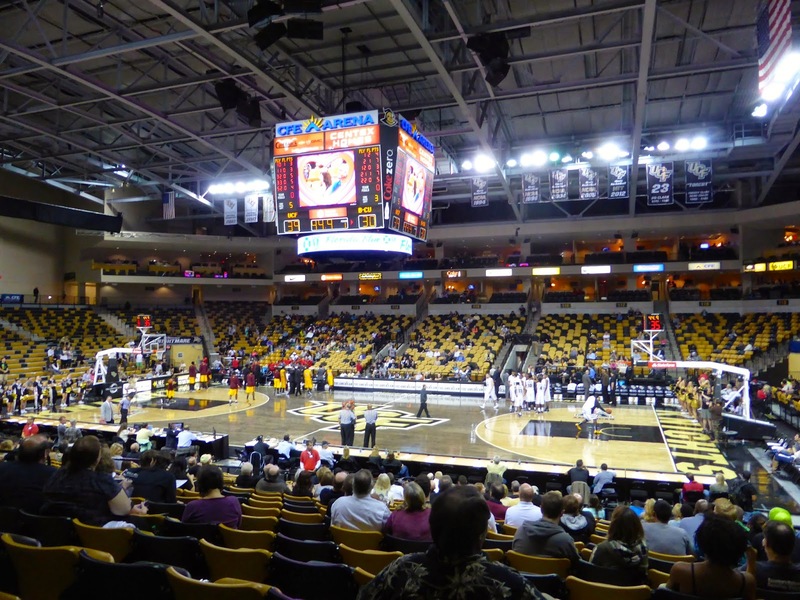 As UCF is part of the American Athletic Conference, their games are all on ESPN3, so you can watch at home, should you live in the US, have cable, and actually care about college basketball featuring unranked teams. Which you should, as without the hype, the games are pretty interesting. By the way, if you do happen to see a game here, avoid the upper deck if you can. They seem to turn the lights off there, making it even darker than Barclays Center, as you can see below. I'm not going to recap the game, other than to say that one player stood out on this evening: Justin McBride, on the left below. Do a Google search and you'll find a bull rider as the top hit, but UCF's McBride might just take over top spot if he continues to play like he did this night. At 6'10 and 325 pounds, he is built more like an NFL offensive lineman, but he has a surprising finesse game that was on full display. From the moment I sat down, McBride was on fire, including several layups like the one below. He finished with 31 points and 8 boards along with a steal and a block, all in just 22 minutes off the bench. 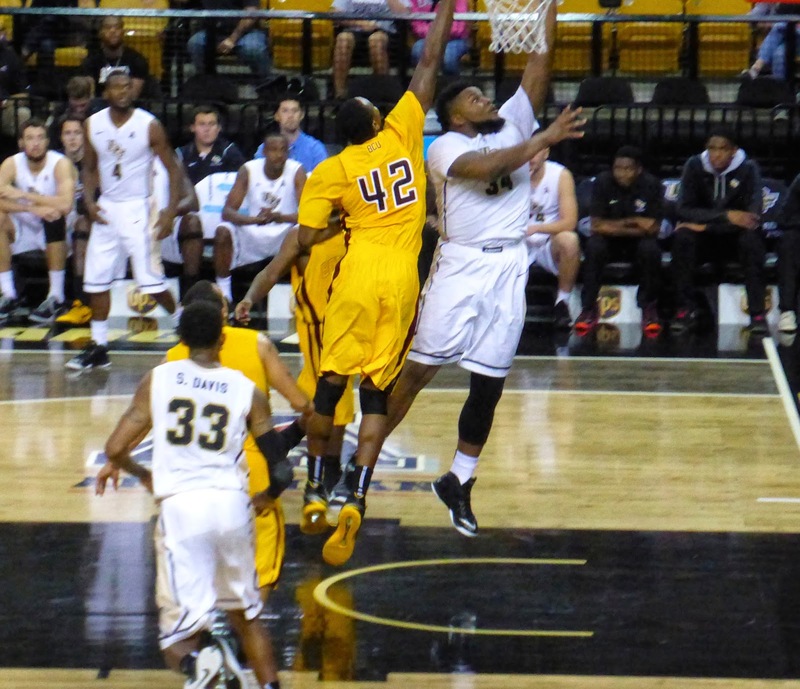 UCF had a 10-9 lead when I walked in and a McBride bucket made it 12-9, after that Bethune-Cookman never got closer than two points. 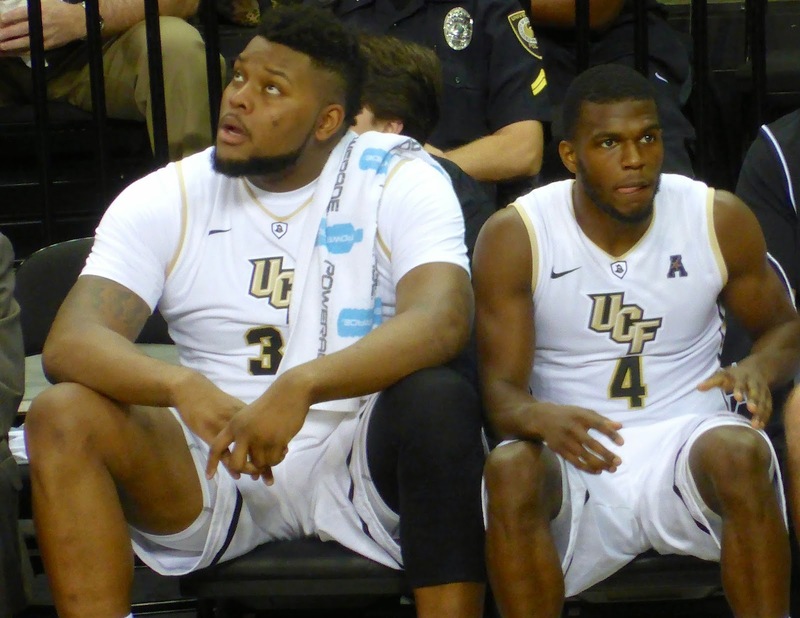 It was really impressive to watch and although McBride's build will likely preclude him from achieving NBA stardom, he might end up with a cult following should UCF make it to the NCAA tournament. There's your final below, Bethune-Cookman had three players in double figures but it didn't matter with McBride doing so much damage, scoring over 40% of his team's points. 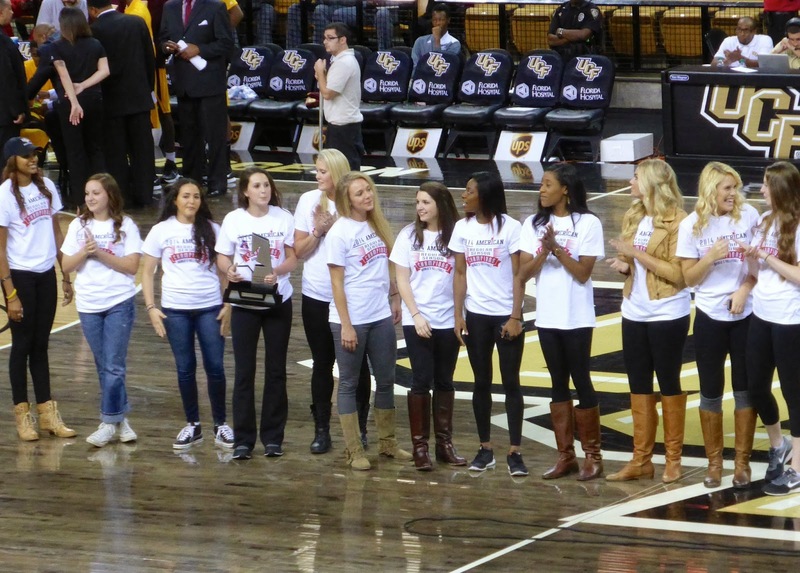 The UCF volleyball team won the American title and were feted at halftime (below, note the trophy). They lost in the first round of the national tournament to Miami. I saw four games this weekend, and the two college hoops games were more entertaining than the NFL and NHL games. It helps when you can sit close and the games are competitive, but in terms of value for price paid, college basketball, when featuring teams that aren't in the top 25 at least, is one of the best options out there for sports travellers. Finally, I've never seen the mascot do this before. Pretty impressive. 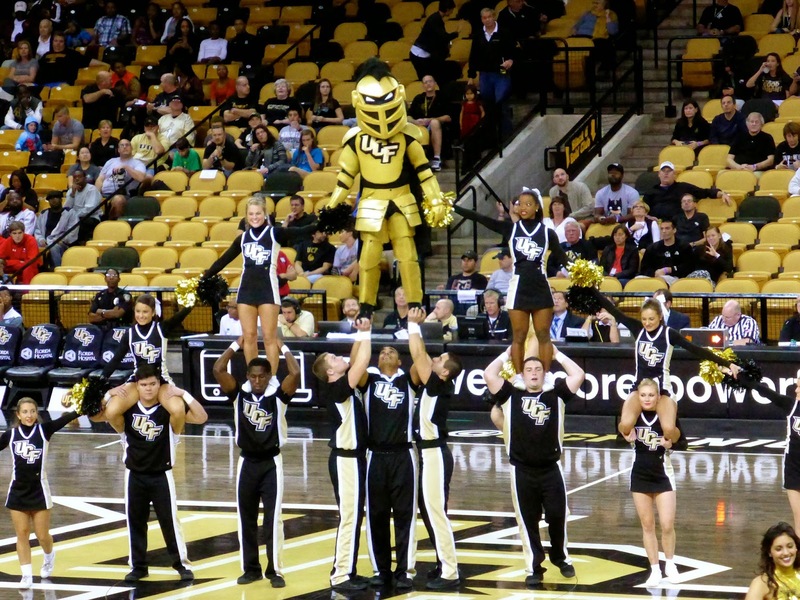 UCF actually won the national title for cheerleading (yes, there is such a thing) in 2003 and 2007, although I am pretty sure having the mascot participate would not help your chances.